This is a newly manufactured 30 cal ammo can that is a perfect solution for long-term storage of your ammunition. This can is manufactured to DOD M19 specs and will hold 500 rounds of boxed .223/5.56 or up to 1100 loose 9mm rounds. These ammo cans were built to protect your ammo in any environment. The lid locks tight and creates a tight seal to keep out moisture. This ammo can is a great way to store your ammo for an extended period of time, but it also works great for transporting your ammo. This 30 caliber can is quite bit lighter than the popular 50 caliber ammo cans when filled with your ammo, so it makes transportation to and from the range much easier. Order this ammo can today to go along with your BULK order of ammo! Good for the range but check the size! Great ammo can BUT I got the size wrong - for storage this is way too small - will be getting the 50 cal boxes next time. It's fine for the range but even then it's a bit small if you take the shotgun! I should have double checked the size as these will only hold 350 rounds of boxed 9mm so next time will buy the larger size. The ammo cans were in tip top condition and the seals were very tight. They were just what I needed to put my ammo in to keep safe and dry. 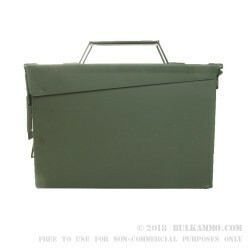 Ordered the Ammo Can as part of my first order ever, with BulkAmmo.com and the process was great. Quick shipping, good packaging, and item was exactly as described. As the ammo can does have a gasket on the lid, so your initial opening of the can may be a little difficult to break the gasket seal. But once open, it's a great container and stores all my 9mm target ammo. If you have a lot of ammo in the paper boxes that they came in, buy some of these cans and dump your ammo in them. The ammo will last longer and take up a lot less space. If you need it, you really don't want to have to paw through many paper boxes to get a mags worth. Here at 6000', the cans do "outgas" a bit when you open them, this is very reassuring. Q: Are the ammo boxes advertised made in the USA? A: Hello Ron, This ammo cans are distributed by Blackhawk and according to them, are manufactured in the US.